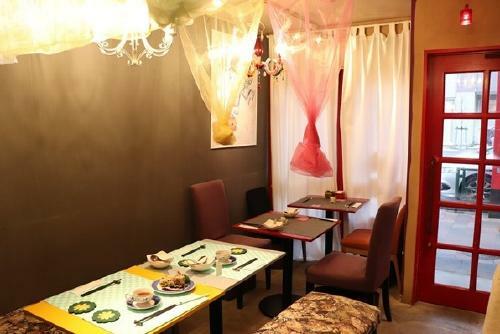 Gavy Setagaya newly opened last December when the restaurant, Yakuzen Ramen Dragon, completed its long-awaited relocation and changed its name. Their menu has been updated to much healthier offerings. Chef Masayuki Shimada adjusts the menu according to the yakuzen (traditional Chinese medicinal cuisine) practice to match the physical conditions of the customers. We had the opportunity to speak with the chef who, even in the new location, welcomes the patrons as a mother greets her children when they come home. Click here for location and detailed information on Gavy Setagaya. 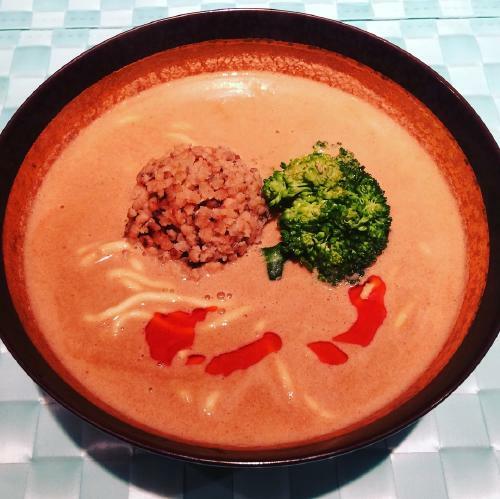 1 Newly opened restaurant that incorporates gluten free, low carb, yakuzen, and vegan. 2 Inventive Soytalian – the more you eat, the healthier you become! 4 The creative chef who prepares the dishes with inspiration from the patrons. Newly opened restaurant that incorporates gluten free, low carb, yakuzen, and vegan. Kamimachi Station on the Tokyu Setagaya Line may not seem so well-situated to those who are not familiar with the area, but it is actually only 20 minutes from Shibuya by bus. 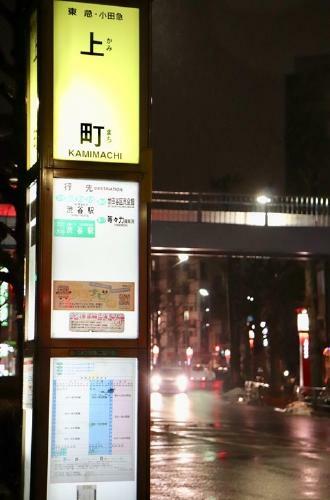 The restaurant itself is only about 2 minutes away from Kamimachi Station. The establishment exudes a retro atmosphere that is welcoming even to female patrons visiting solo. Elegant chandeliers illuminate the interior. The name Gavy originates from an acronym of the key aspects of the menus: G=gluten-free, A=antiaging, V=vegan, Y=yakuzen. Inventive Soytalian – the more you eat, the healthier you become! 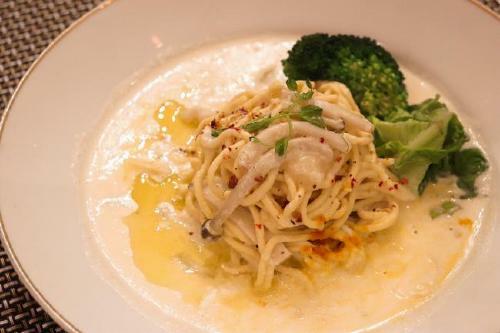 The concept of the restaurant is “Soytalian,” a combination of soy and Italian, and because of this, the majority of the dishes contain soy meat and/or soymilk. The thick, egg-yolky sauce appears as if real eggs are in it. The sauce is made with a mixture of the Mame Plus soymilk cream and premium soymilk and it is bursting with the flavor of the soybeans. Konbu (kelp) broth is then added to this mixture for a deeper flavor that is rich with umami. The soymilk cheese is added for some kick and texture. Soybeans are rich in isoflavones which are noted for its beautifying effects. The plant-based raw ingredients help keep the calories and cholesterol low even if you’ve had a full meal. Celebrities and trend-setting women have quickly caught on to this newly opened restaurant to enjoy the health benefits of its offerings. Chef’s Inventive Plate of the Day featuring Amazake (sweet fermented rice drink). 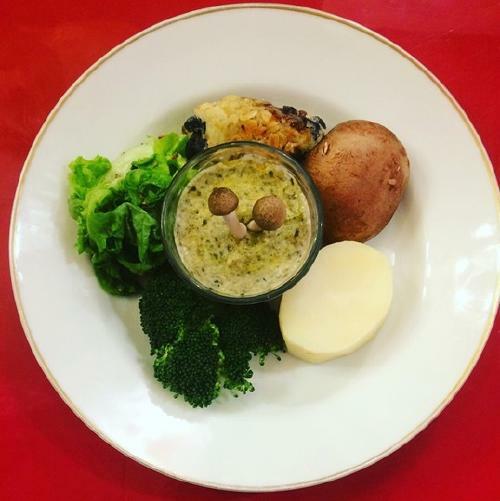 Amazake hummus and nanohana (rapeseed) seasoned with amazake mustard sauce are some of the combinations that might surprise you. But these are very tasty and may have you hooked. The kiriboshi daikon (dried daikon radish) aemono (dressed dish) was magnificent! The robust flavor of the hatcho miso (a type of miso) combined with the tang of the amazake created a pleasant harmony in the mouth. The creations of the chef are fantastic combinations of flavors and tastes that would otherwise be hard to imagine just by reading the menu. The one thing that you must have when you visit Gavy is the various healthy ramen which have been carried over from the previous restaurant. 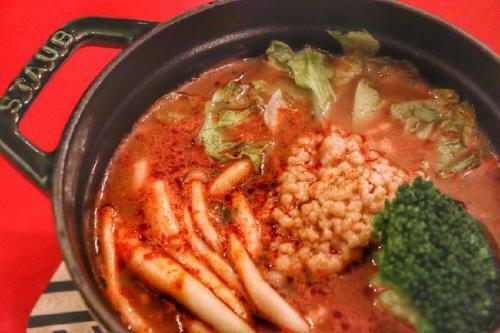 Above is “Gavy’s STAUB Hinabe (Chinese-style hotpot) Noodles” (1,500 yen with tax), which is a dish served in the professional cast iron STAUB pot. The Szechuan chili bean sauce seasoning (香辣醤) adds the perfect spiciness with its chili peppers, star anise, and peppercorn. The additional 13 different spices in the dish help keep the body warm. 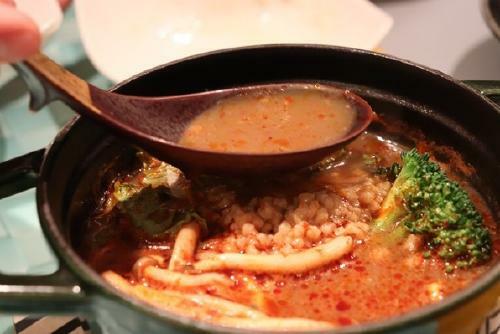 The aromatic soup is so addictive that you won’t be able to stop. According to the chef, the STAUB pot brings out the full flavor of the dish that can’t be achieved simply by stewing the ingredients. The noodles are topped with soy meat, broccoli, lettuce, and shimeji mushrooms. 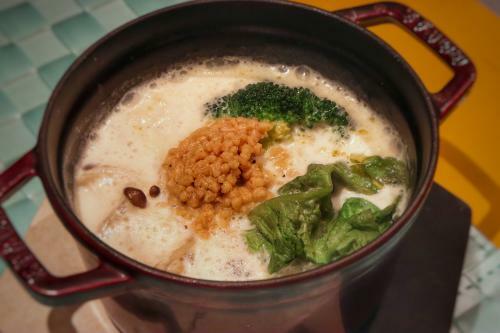 Another STAUB ramen variety is the “STAUB Pot Noodle Premium Soymilk” (1,500 yen with tax) featuring the creamy and thick premium soymilk. 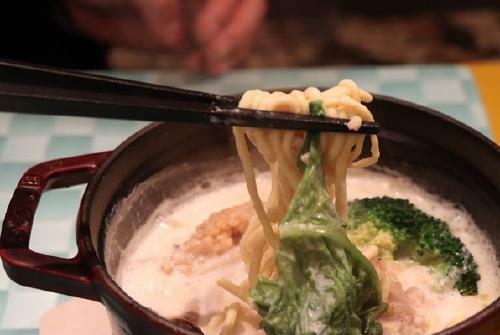 The noodles at Gavy Setagaya are made with konnyaku (konjak yam roots), okara (soy pulp), and soymilk cream. They are gluten-free, carb-free, and are low in calories. So many benefits! The noodles are very smooth, although not as smooth as a konnyaku. They have a unique chewy texture that holds the soup beautifully. Another point to add is that they don’t become overcooked after time. ”Gavy’s Tan Tan Men” (1,500 yen with tax) is a favorite among the regulars! The creative chef who prepares the dishes with inspiration from the patrons. Chef Shimada always had a passion for cooking. He began his search for a location to open a restaurant and stumbled upon a property which included a noodle-maker machine. He then acquired the skills to make noodles and began his career as a chef when he opened a Chinese restaurant. 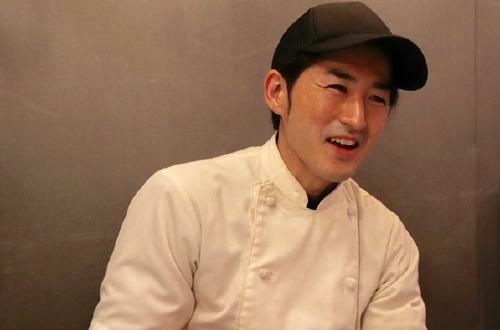 He then went on to become a certified yakuzen coordinator and supported the health of the locals during his years as a chef at Yakuzen Ramen Dragon. When we asked the reason for his interest in yakuzen, we were very surprised to hear his answer! By changing his diet, he was able to lose 30kg in 1 year. There is even a customer who dropped 10kg by frequenting the restaurant. Chef Shimada is an expert at utilizing his knowledge to create the dishes that have been inspired to suit each of the customers. He inquires his customers about their preferences and physical conditions and prepares customized dishes for them. 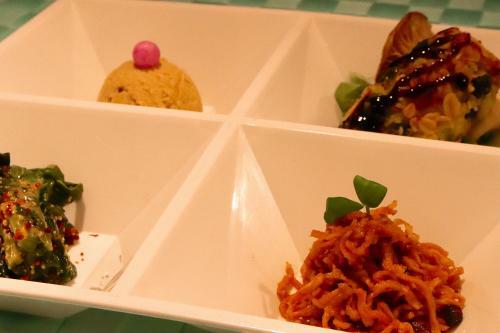 There were initially no vegetarian menus, but the options increased with the demand. ”I’d like for the customers to come frequently. It is easier for me to cook for them if they visit multiple times. I become more familiar with them and I can cook to suit their conditions and preferences. I was told that ‘the best way to satisfy a customer is to consider whom you are cooking for by listening to what they like rather than preparing a delicious dish.’ and it hit me. I make it a point to prepare my dishes with the customer in my thoughts and with the feelings similar to that of a mother’s.